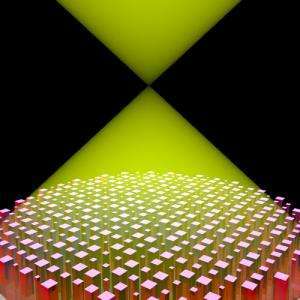 Last summer, researchers at the Harvard John A. Paulson School of Engineering and Applied Sciences (SEAS) announced a new, flat lens that could focus light with high efficiency within the visible spectrum. The lens used an ultrathin array of nanopillars to bend and focus light as it passed. The announcement was hailed as a breakthrough in optics and was named among Science Magazine's top discoveries of 2016. But the lens had a limitation – it could only focus one color at a time. Now, the same team has developed the first flat lens that works within a continual bandwidth of colors, from blue to green. This bandwidth, close to that of an LED, paves the way for new applications in imaging, spectroscopy and sensing. The research is published in Nano Letters. One of the major challenges in developing a flat, broadband lens has been correcting for chromatic dispersion, the phenomenon where different wavelengths of light are focused at different distances from the lens. "Traditional lenses for microscopes and cameras—including those in cell phones and laptops—require multiple curved lenses to correct chromatic aberrations, which adds weight, thickness and complexity," said Federico Capasso, Robert L. Wallace Professor of Applied Physics and Vinton Hayes Senior Research Fellow in Electrical Engineering. "Our new breakthrough flat metalens has built-in chromatic aberrations corrections so that a single lens is required." Correcting for chromatic dispersion—known as dispersion engineering—is a crucial topic in optics, and an important design requirement in any optical systems that deals with light of different colors. The ability to control the chromatic dispersion of flat lenses broadens their applications and introduces new applications that have not yet been possible. "By harnessing chromatic aspects, we can have even more control over the light," said Reza Khorasaninejad, a Research Associate in the Capasso Lab and first author of the paper. "Here, we demonstrate achromatic flat lenses and also invent a new type of flat lens with reverse chromatic dispersion. We showed that one can break away from the constraints of conventional optics, offering new opportunities only bound by the designer's imagination." To design an achromatic lens—a lens without chromatic dispersion—the team optimized the shape, width, distance, and height of the nanopillars that make up the heart of the metalens. 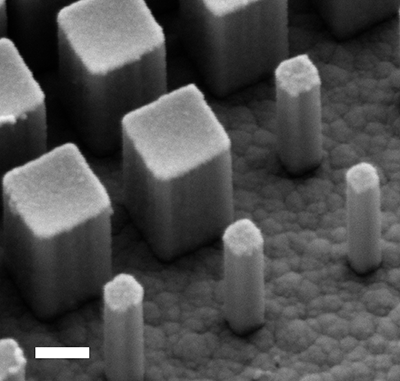 As in previous research, the researchers used abundant titanium dioxide to create the nanoscale array. This structure allows the metalens to focus wavelengths from 490 nm to 550 nm, basically from blue to green, without any chromatic dispersion. "This method for dispersion engineering can be used to design various ultrathin components with a desired performance," said Zhujun Shi, a PhD student in the Capasso Lab and co-first author of the paper. "This platform is based on single step lithography and is compatible with high throughput manufacturing technique such as nano-imprinting." Harvard's Office of Technology Development has filed patent applications on a portfolio of flat lens technologies and is working closely with Capasso and members of his research group to catalyze commercialization of this technology through a startup company. Revolutionary ultrathin, flat lens: Smart phones as thin as a credit card?